The self-locking automatic door lock from MACO, the A-TS triple locks the door automatically when closed. The 3-fall principle ensures high contact pressure and proper closing before the two steel hooks and also the main locking bolt extend automatically. The 3-fall principle: articulate, down to the last detail – It guarantees evenly high contact pressure and thus closes the door precisely and tightly across the entire door from top to bottom. This ensures a consistent, durable, smooth and comfortable closing and opening for many years and protects against distortion of the door as well as against drafts, moisture, heat loss as well as against noise. Triple lock without a key – A unique feature of the A-TS is the functional separation of contact pressure and locking. Mechanical status monitoring on the main latch and magnetic releases in the frame ensure that the door “sits” perfectly before the shutter mechanism is released. Once the correct position of the door leaf is ensured, two hooks and the steel locking bar will activate ensuring triple automatic security. 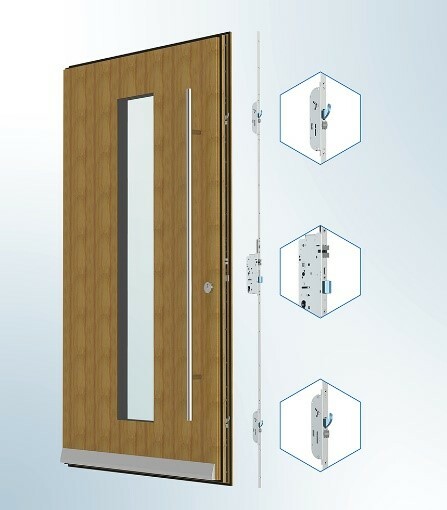 A world of additions from MACO Versatile and flexible in use the additions to create the perfect and complete door solution from MACO include additions such as the MACO door limiter, electric opener, escutcheons, Pull bar (with & without fingerprint scanner – 1200mm Pull bar only) or motor. This results in practical additional functions and versatile options for all. The A-TS with motor opens up new dimensions in access. Combined with access solutions such as fingerprint, touchpad, transponder or smartphone enabling multiple options for smart access. All A-TS versions are suitable for installation in Timber Doors, PVC-U doors, and aluminium doors. Meaning you can add the most versatile, secure and premium automatic door lock to your doors. The brochure for the new A-TS is now available, please E-mail Enquiry@macouk.net for your copy. The A-TS will be on the MACO stand at FIT Show 2019. Come over to stand J40 and MACOnnect with us to see the A-TS Door lock and how we are creating Innovation across window and door hardware. Email, Enquiry@macouk.net to secure your invite to be the first to see the A-TS Door Lock.